Chef Jose Hernandez, a graduate of The Falls College culinary program in Spokane Washington, began his professional cooking career over 20 years ago. With an interest in French, Asian, and Latin cuisines, Chef Hernandez is the winner of multiple master chef challenges and other awards for his delicious cuisine. 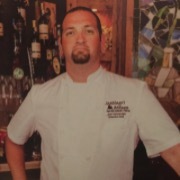 Chef Hernandez has been at Santiago’s Bodega since 2008, and serving as the Executive Chef since 2011.